Feline infectious peritonitis (FIP) is a fatal, immune-mediated disease, triggered by infection with a feline coronavirus (FCoV). Approximately 1 of every 200 new feline cases presented to American Veterinary Teaching Hospitals are ultimately diagnosed with FIP. Coronavirus-specific antibodies are present in up to 90% of cats in catteries and in up to 50% of those in single cat households. However, only about 5% to 10% of FCoVinfected cats develop FIP in a multi-cat household situation. In orther words almsot every cat carries a form of the coronavirus and a few of these cats will unfortunarely develope what is know as FIP regardless of what the anyone does to prevent it. If you bring a kitten in to your home and you have other cats your kitten will be at greater risk for FIP because your kitten will most likely be exposed to a different strain of the coronaviris and that new strain will be at higher risk for turning into into FIP and the breeder can not be held responsible if you have a mulit cat household. If you have a mulit cat household do not let your young kitten share a litter box with adult cats and use a seperate scooper to clean your kittens litter box this will reduce your chances of FIP, a bleach water solution kills the virus and can be used to clean litter boxes / scoopers if you have / had a FIP kitty or if you want to reduce your chances of developing FIP; with that said only about 5% of cats develop FIP in a multi-cat household situation.  The common Feline Enteric Coronavirus appears to be the parent of the virulent FIP virus (FIPV). FIPV is a virulent mutation of the benign enteric coronavirus.  There is good evidence that certain cat breeds, and lines within breeds, are genetically predisposed to develop the disease we call ‘FIP' if viral mutation does occur...ie, mutation alone may not cause the disease...genetics appear to play an important role.  FIP will mainly develop in cats whose immunity is low; such as younger kittens, old cats, immunosuppression due to FeLV /FIV and stress, including the stress of separation and adoption.  The risk of FIP is greatest among cats living in cluster (multiple-cat) households, ie, there’s more virus transmission and, therefore, more virus replication, and therefore, more chance for mutation.  Coronavirus infection in cats is common (50-80% of all cats)...shedding among infected cats is common...but FIP is relatively uncommon.  There is no consistently reliable diagnostic test other than histopathology (Lesion: vasculitis). Random errors can occur in the virus infecting an enterocyte causing the virus to mutate from FECV to FIPV. A house hosting 2 cats therefore has a mutation risk = 2. when 4 kittens born into this house, the risk goes up from 2 to 30. Cats visiting communal litter trays can be permanently infected with a larger number of different strains of virus. In their pre-domestication natural state cats were solitary animals and didn't share their areas (hunting areas, rest areas, defecation sites, etc.). Domestic cats living in a group create a much higher epidemiological risk situation. After this mutation, the FCoV acquires a tropism for macrophages  (see also: Immune cells, leucocyte, monocyte, dendritic cells, mononuclear cell, antigen-presenting cell) while losing intestinal tropism. In a cat group, overcrowding increases the risk of mutation and conversion (from FECV to FIPV) and constitutes a major risk factor for the development of feline infectious peritonitis(FIP) cases. FIP will mainly develop in cats whose immunity is low; such as younger kittens, old cats, immunosuppression due to viral — FIV (Feline immunodeficiency virus) and / or FeLV Feline leukemia virus and stress, including the stress of separation and adoption. Virus mutation: this virological factor depends of the replication level. Immune status of each cat, which is related to the age, the genetic pool and the stress level : the more the immune status is good, the more the virus is slowed down. and feline coronavirus, no clear cause and effect has yet been proven. Experts do not always agree on the specifics of FIP. However, the most common theory is that the normally benign FECV mutates into FIPV. The mutated virus has the ability to invade and grow in certain white blood cells, namely macrophages. The immune system's response causes an intense inflammatory reaction in the containing tissues. This disease is generally fatal . However, its incidence rate is roughly 1 in 5000 for households with one or two cats. A nasally administered vaccine for FIP is available, but controversial and isn't proven to be highly effective. . Great strides are being made with an experimental polyprenyl immunostimulant being manufactered by Sass and Sass and tested by Dr. Al Legendre. In one case study, a female cat diagnosed with dry FIP has survived 26 months from the date of definitive diagnosis (Fall 2009). See also the special article about Feline Coronavirus. Despite the prevalence of FECV, most infected cats do not develop FIP. Often, exposure to FECV produces no clinical signs, but may cause a mild diarrhea. Therefore, a cat without clinical signs may still be an FECV carrier and may pass the virus to another cat. In any cat infected with FECV there is a chance that the virus may mutate into the FIP causing form. This chance is increased for cats that are immune-compromised, including very young and very old cats. There is also thought to be a genetic component to susceptibility to viral mutation. The signs associated with FIP are often non-specific, which can cause diagnosis to be very difficult. There is as yet no definitive diagnostic test for FIP. Diagnosis may include a combination strong clinical suspicion, physical examination findings, presence of abdominal fluid with characteristic chemistry changes and examination of affected tissues for the FIP virus (this is usually performed post-mortem, but can be performed via tissue biopsy). Histopathological examination of tissue samples is usually the cheapest available diagnostic test, but its sensitivity and specificity for FIP is questionable. A polymerase chain reaction test is also available for use with fluid or certain tissue samples; however, its efficacy is currently being reviewed. More commonly, a presumptive diagnosis is made based on clinical signs and evaluation of abdominal or chest fluid, if available. Fluid caused by FIP tends to be yellow in color and have elevated protein levels. Blood tests can also be performed to bolster a presumptive diagnosis by looking for coronavirus antibodies and elevated protein. Coronavirus titers are NOT considered diagnostic in and of themselves due to the ubiquity of FeCoV, but may be used in conjunction with clinical symptoms to make an FIP diagnosis. It is important to note that cats with higher titres of FCoV are no more likely to develop FIP than those with lower titres. In the presence of abdominal or chest fluid, a simple test called Rivalta test can be used to differentiate fluid resulting from FIP from fluids resulting from some other disease with very good accuracy. Accepted wisdom is that there is no cure for FIP; treatment is symptomatic and palliative only, i.e. typically the owner is advised to make the cat as comfortable as possible. Prednisone or other immunosuppressive drugs prescribed by a veterinarian may help to prolong the cat's life for a few weeks or months, but may be contraindicated in certain cases due to concomitant infection(s), although this risk can be mitigated somewhat by also treating with antibiotics. Newer approaches using immune modulators are being developed by several companies. Effusive FIP usually progresses too rapidly for any meaningful therapy to be attempted. Quarantine is not necessary as FIP is not truly an infectious disease. Feline Enteric Coronavirus is shed in the feces and can be passed on to other cats, however, it is the mutated form of the virus that leads to FIP. 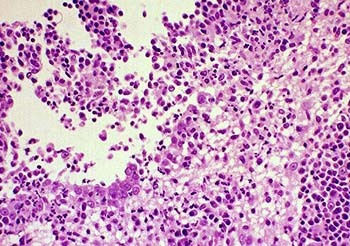 This form is only found in macrophages and is therefore not shed and not contagious. As FIP signs can be easily overlooked, it is highly advised to have your cat examined by your family veterinarian at any signs of abdominal distention, changes in the eyes, chronic diarrhea, unusual lethargy or respiratory infection. While treatment will only be symptomatic, it may prolong the life of the cat as well as soften the blow to the owner. FIP patients can benefit from cytotoxic drugs such as methotrexate and cytoxan, and from corticosteroids such as methylprednisone or prednisolone; although it is not a cure, it often improves appetite and weight, and can make the cat less lethargic. In some cases, cytotoxic drugs can induce a brief remission, and even corticosteroids alone can give the cat 3-5 more months of good quality life. In spite of these treatments, however, prognosis remains extremely poor.